On a recent road trip traveling south from Kansas City, heading south to Branson, and then dropping down into the Ozarks, I planned a stop at Courseys Smoked Meats in St. Joe, Arkansas for one of my top 5 sandwiches in the world. 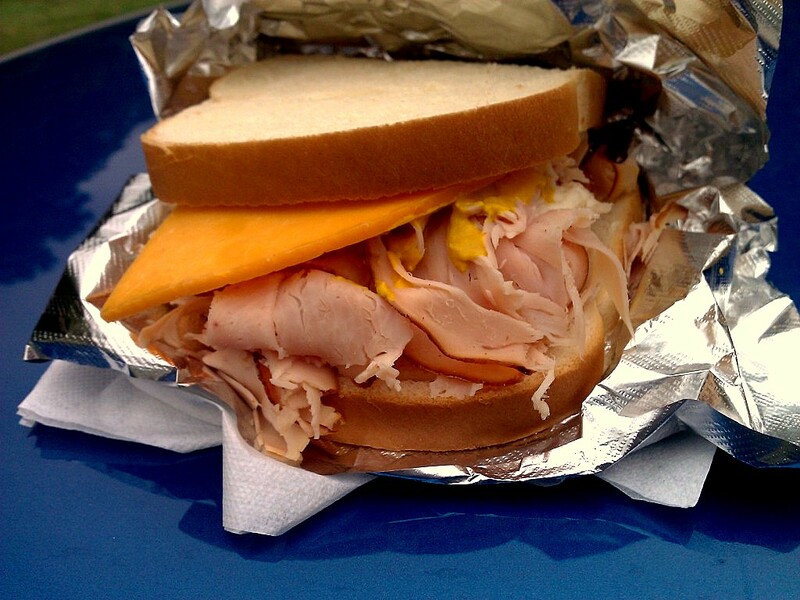 All it contains is a pile of the best smoked turkey this side of Sonoma County, California, sliced razor thin, piled high with homemade smoked cheddar cheese, a little mayo and mustard on white bread. After consuming one of the treasures of The Ozarks, it was hard to keep traveling too long after a meeting in Branson at 8AM and a smoke turkey sandwich at lunch, it was time to find an antique store or something. A sign came up on HWY 65: turn left here to old downtown Leslie, Arkansas. 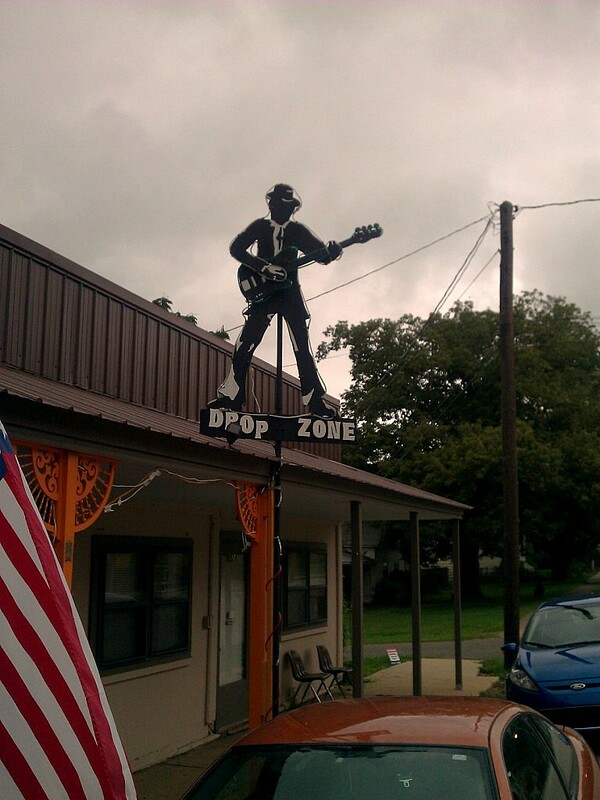 After crossing a narrow bridge and about 100 yards off the main highway, I came face to face with a sign that looked like one of The Blues Brothers playing guitar (but turned out to be Thomas) that read The Drop Zone. I had to enter by another store that had some vintage vinyl upfront, I ended up picking up a King Record 45 and started talking to Thomas about The Drop Zone and what has been going on in Northern Arkansas. 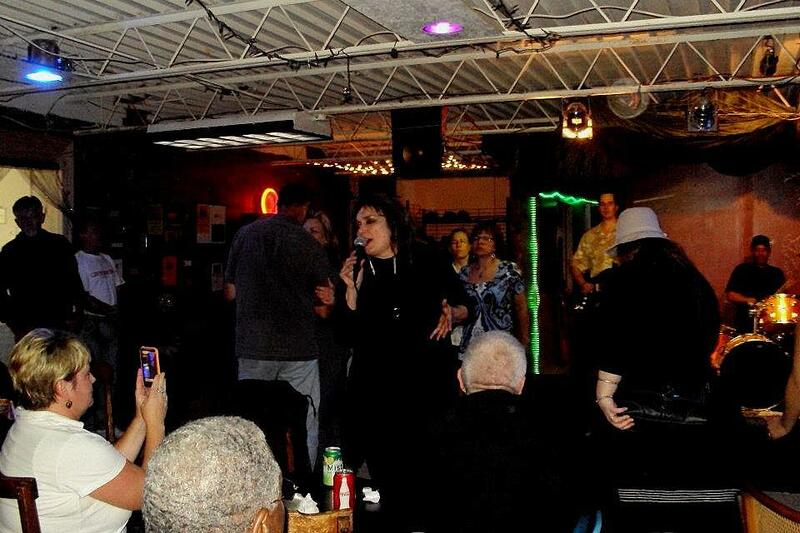 It was like stumbling onto a juke joint in the Mississippi Delta. A great little venue that holds about 85 people, where there are couches, tables, chairs and some room to dance up front. The Drop Zone opened in Leslie, Arkansas on September 9th, 2011. Sandra Chidester is the owner while Thomas Anderson manages and books all of the entertainment. Thomas is also President and Sandra is Secretary/Treasurer of the Buffalo River Blues Society that uses the Drop Zone as its local venue. Leslie, Arkansas is a small town of around 450 residents located in the North Central part of the state. The venue is totally non-alcoholic, non-smoking, all ages and is ranked as one of the best venues of its kind in Northern Arkansas. 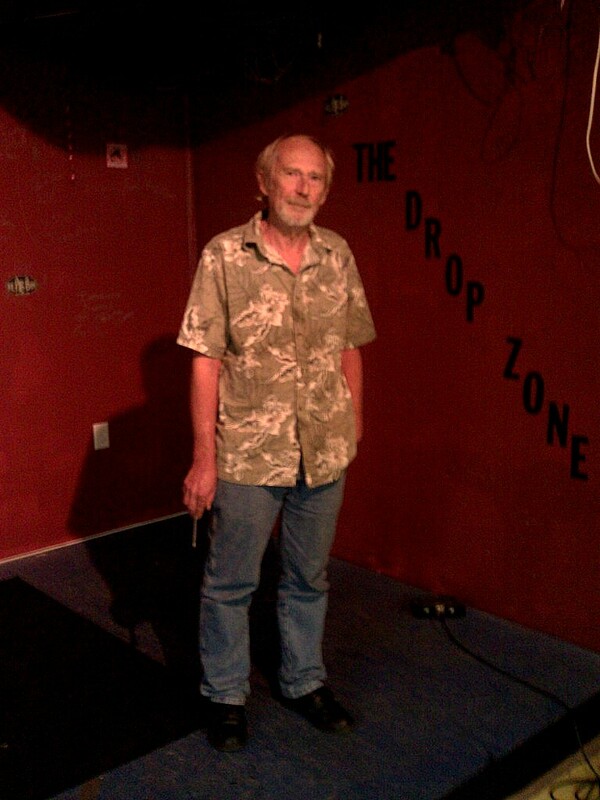 The Drop Zone has been referred to as “like having a juke joint in your living room”. 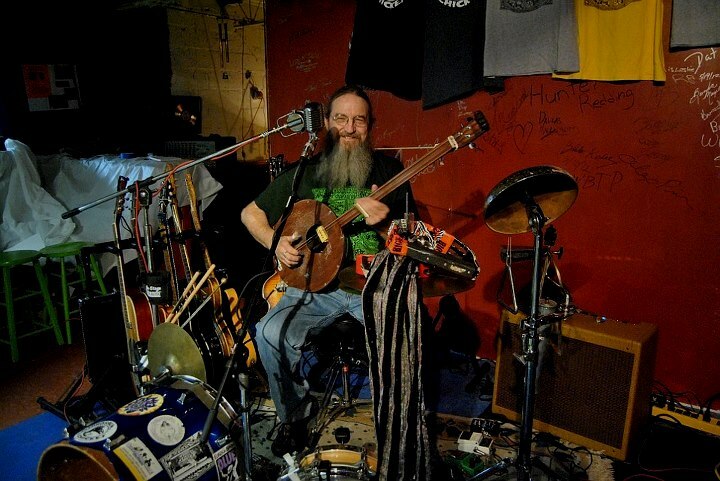 Thomas is an experienced musician having played in an Iowa band in the 60’s called The Nomads for a couple of years before the Vietnam draft caused The Nomads to disband. 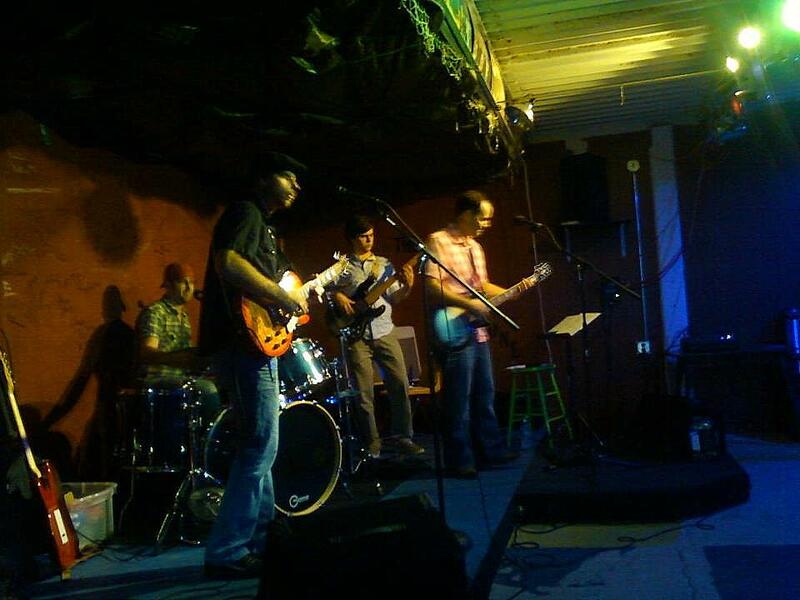 The Drop Zone normally books Blues and Classic Rock bands from all over the Central United States but has had bands from as far away as New York and Canada. The first concert was on the 9th of September, 2011 with 79 inside and another 30 outside dancing in the street. Thomas says, “Clover Blue, a two time competitor at the International Blues Challenge in Memphis just brought the house down that night!” The Drop Zone First Anniversary party featured Arkansas favorites, the Joe Pitts Band. “We have been very picky in finding quality bands and artists who have performed at the Drop Zone. Like Joe Pitts, Cee Cee James, Brenda Meyers, Smooth Down Under, R.B. Stone, Danny Brooks, Tyrannosaurus Chicken and many more. 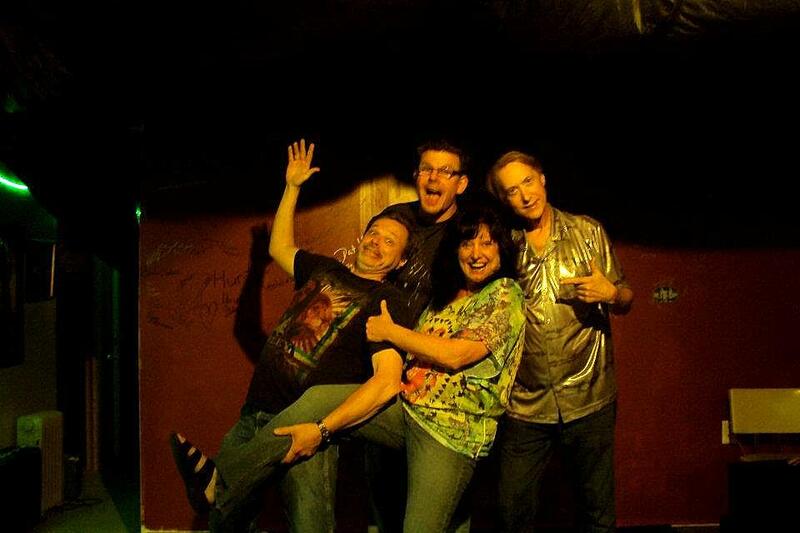 Voodoo Highway from New York, NY will be here for our Halloween party. Our dreams are to someday to be able to afford having the bigger names here: Buddy Guy, Eric Clapton, and Johnny Lang. But, that will be a long time coming,” Thomas muses. The best place to eat, locally, is the Leslie Cafe. 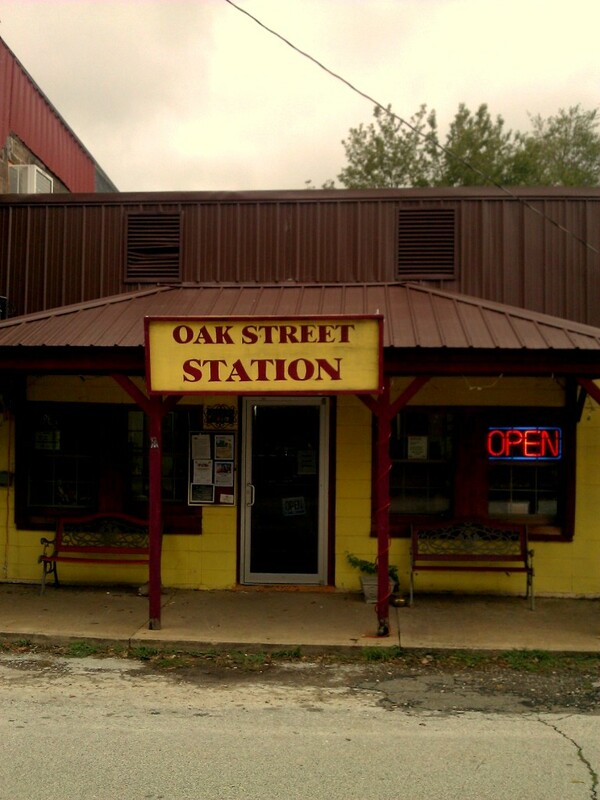 Located on Main Street, the cafe has great owners, great service, and the best home cooking anywhere. Bread and pastries are all made from scratch. The Drop Zone normally takes all the bands there to eat. Lodging is another story. The Marshall Motel is located in Marshall, 8 miles North of Leslie on Highway 65. Nice rooms for those on a budget. Twenty miles to the South is the Best Western located in Clinton. Rooms are nice and loaded with all the amenities. Tell them you would like the Drop Zone rate if you ever get out this way. “This venue knows how to do it right”. For information about the Drop Zone or the Leslie Cafe or for booking these venues, call and talk with Thomas at 501-253-6373. Brad this was such a good read I could only have wished to be there with you. Your writing omission very will done . Love old joints like this as you know.